The target this day was in the upslope regimen of the Cheyenne Ridge through southeast WY with storms expected to develop in the mountains and move out into the High Plains area during the mid to late afternoon.Our group left Colby, KS in the morning and progressed northwest to Cheyenne and then north on I-25 toward Chugwater, WY as a pair of intense storms were already firing on the Laramie Range and about to move off the mountains into the open High Plains.Consequently, this is where the better environment was at with moderately strong heating indicated by SB CAPE values in the 1500-2500 j/kg range, dewpoints adequately into the upper 50’s in a higher elevation area, and strong east-southeast winds at 20-30 kts which led to strong inflow and low level shear.In addition, these storms developed in an area of higher bulk/deep layer shear values of 40-50 kts and could have been higher with a shortwave moving through the region and helping to ignite convection. Upon approaching the storm near Chugwater, it quickly produced a short-lived rope tornado that we did see from 15 miles south of the storm.This tornado touched down near Wheatland, WY.Being so far away from the storm at the time of the tornado, we were not positive that it touched down after seeing the funnel ¾ of the way to the ground, but confirmation came from spotters and chasers in that area that it did indeed touch down around 5pm.The tornado dissipated as we followed to the south of the storm on Hwy 316 and then north in Hwy 160 towards Fort Laramie, WY as the storm continued to right turn and actually take a more east-southeast movement.A couple of rotating wall clouds were seen along the storm path, as well as a very interesting lowering on the left split storm to the north of ours that did end up becoming tornado warned.Our storm ended up moving out into an area with no roads upon crossing the WY/NE border so we ended up going north on Hwy 85 towards Lusk, WY and then east on Hwy 20 where we intercepted again near sunset in Crawford, NE.We witnessed a spectacular lightning show before ending the chase here and traveling to Valentine, NE for the night. Tough to see, but this is the tail end of the tornado way in the distance near Wheatland, WY. 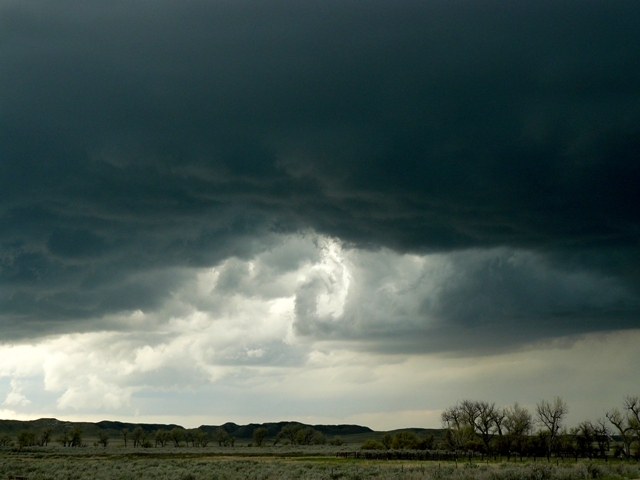 Lowering underneath a new updraft on the storm near Wheatland, WY. 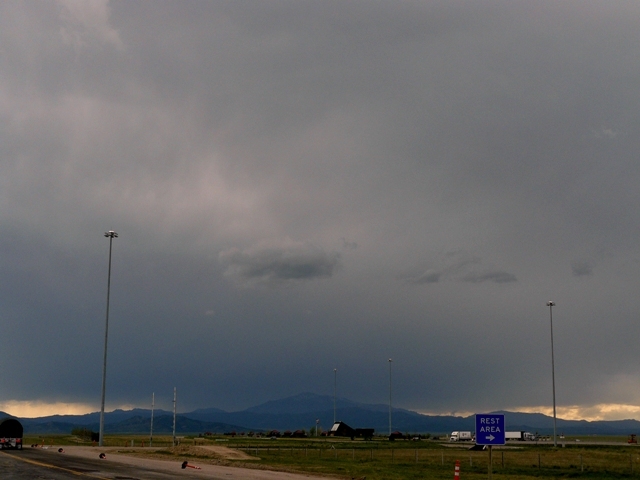 Another storm coming off of the Laramie Range in WY. Two new explosive updrafts on our storm east of Wheatland, WY. Horizontal funnel forming on the leading edge of the RFD clear slot.